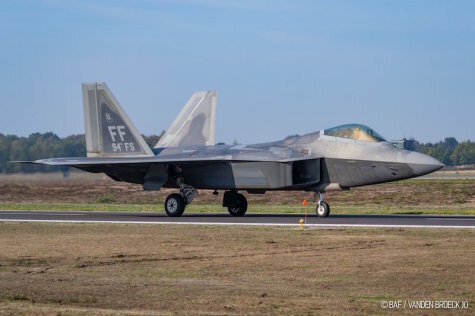 F-22 Raptor aircraft arrived at Kleine Brogel Air Base, Belgium today from RAF Lakenheath, England, to conduct local training with the Belgian air force. The F-22s are deployed from the 27th Fighter Squadron, 1st Fighter Wing, Joint Base Langley-Eustis, Va. and arrived in Europe on Oct. 5. Prior to arrival, the Raptors conducted dissimilar aircraft combat training with Belgian F-16s in nearby aerial training areas. We appreciate our close cooperation with Belgium in the training of fighter aircraft to ensure the security of Europe. The presence of F-22 aircraft underscores our commitment to the collective defense of the NATO alliance and our willingness to use our most technically advanced assets to deter any potential threats and increase regional security.